Why are we even comparing these two products, you may ask. Rebounding is often overlooked as a form of exercise maybe, because they are not covering the field of view as you enter a gym. Just because you see the treadmill first, doesn’t mean it is actually the best machine for the job. You have to ask yourself, what are you trying to accomplish? prevent falling. 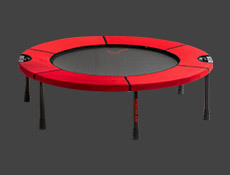 Rebounding encourages simultaneous upper body exercised. This is called “Aerobic Resistive Rebounding.” Inexpensive hand held weights are an effective way to improve upper body tone. These are available in our on-line catalog. Keeping your hands free is not the only worry that is present in treadmills that are not in rebounders. Incorrect use, over-use, or the occasional accident on a treadmill can result in bad falls resulting in skin abrasions and contusions, shin splints, and chronic joint problems are also common. Children should not be allowed near the treadmill while in use! Not for many people with disabilities. 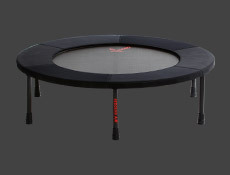 The use of a ReboundAIR™ poses no pattern of harm. High-end rebound exercise equipment is commonly used in physical therapy clinics and recommended for patient in-home use. 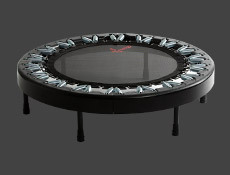 People of all ages, from the toddler to the elderly, absolutely love to exercise on a ReboundAIR™. “Safe and effective,” say the Journal of Cardiopulmonary Rehabilitation. The thing that first struck me when I pulled it out of the box is the quality of it. The workmanship is top notch. I would like to add that a feature I didn’t notice your website mention is the fact that no assembly is required. Just unfold and you’re ready to jump to it. Again, thank you for your high quality product and the free gifts.